We trade in Nepal, but we are open to trade enquires for books and maps from all over the world Publishing can be expensive but we try to keep costs and prices as low as possible DISCOUNT OFFER! 20% off on selected Vajra Publications. 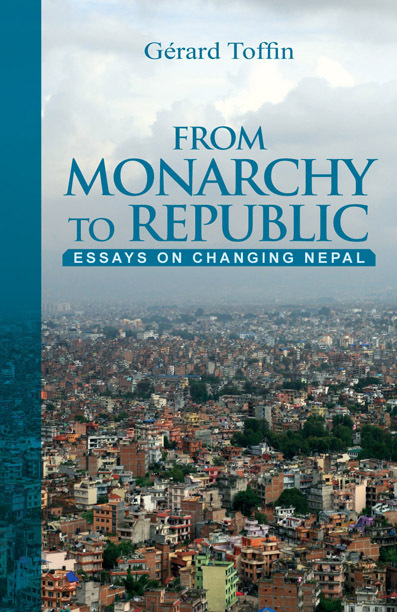 About the Book: Since the fall of the Rana oligarchy in 1951, Nepal has undergone a series of political changes which culminated in the proclamation of a federal democratic republic in May 2008. Besides the shift in its political regime and a ten-year civil war, the country has been facing tremendous transformations in all sectors of life: economic, social and religious. It has therefore become a fascinating laboratory of change. At the same time, Nepal has had to contend with considerable difficulties. Successive governments have failed to improve people's living conditions and to open news perspectives. A massive exodus of migrants is taking place in the search for employment and for a better life abroad. By and large, Nepal's path to democracy has proved to be chaotic. This book, written by a social anthropologist who has been working on Nepal for more than forty years and who has close contact with the country, highlights the cultural and social aspects of these impediments, failures, successes and transformations. It sets out to show the realities of a highly fragmented nation facing head-on the new wind of globalisation. The book will be of use for all those wishing to understand the current situation in Nepal, the presence of the past in the present, and the social forces at work. It will also be of interest to those who are attentive to the ongoing processes of democratisation in South Asia. About the Author: Gerard Toffin, Director of Research at CNRS (National Centre for Scientific Research), is a member of the Centre for Himalayan Studies, France. He started his research on Nepal in 1970, after a post as Cultural Attache at the French Embassy in Kathmandu and as a French teacher at Darbar School. An expert in Nepali culture and society, he has published a number of books on the Newars of the Kathmandu Valley and on religion in Nepal. He has also carried out research on the Tamangs of Ganesh Himal (Dhading District). His recent books include: Newar Society. City, Village and Periphery (Himal Books, 2007, 2008); in collaboration with Joanna Pfaff-Czarnecka, The Politics of Belonging in the Himalayas. Local Attachments and Boundary Dynamics (Sage, 2011); and, in collaboration with Marine Carrin and Pralay Kanungo, The Politics of Ethnicity in India, Nepal and China (Primus 2013). In May 2013, he received the Nai Derukh International Award in Kathmandu for his contribution to the study of Nepali culture and society. A great bookstore in Kathmandu - highly recommended! Bidur's Vajra books, the best bookstore in KTM: BRAVO BIDUR!! © All Rights Reserved 2009 - 2019, Vajra Books and Vajra Publication, Jyatha, Thamel, P.O. Box : 21779, Kathmandu, Nepal.